As a former dog owner, I know how challenging it can be to find the best care for your four-legged-friend when going on vacation or taking a trip. While boarding dogs at kennels is an option, I always prefer to have a dog sitter at an actual home (or at my own home) take care of my pet to ensure one-on-one care. The difficulty is actually finding dog lovers who want to babysit for dogs in their spare time. Enter DogVacay, a new marketplace out of Los Angeles incubator Science, that matches dog owners in need of pet-care services with qualified animal caregivers. The service is launching today in Los Angeles and San Francisco. Founded by a husband and wife team, Aaron Hirschhorn and Karine Nissim Hirschhorn, DogVacay was inspired by the couple’s desire to find a real, loving home for their own dogs, so that their boarding experience is as much a vacation as their owner’s. As Hirschhorn tells me, there are many caregivers who love pets and use this as a way to make supplemental income. 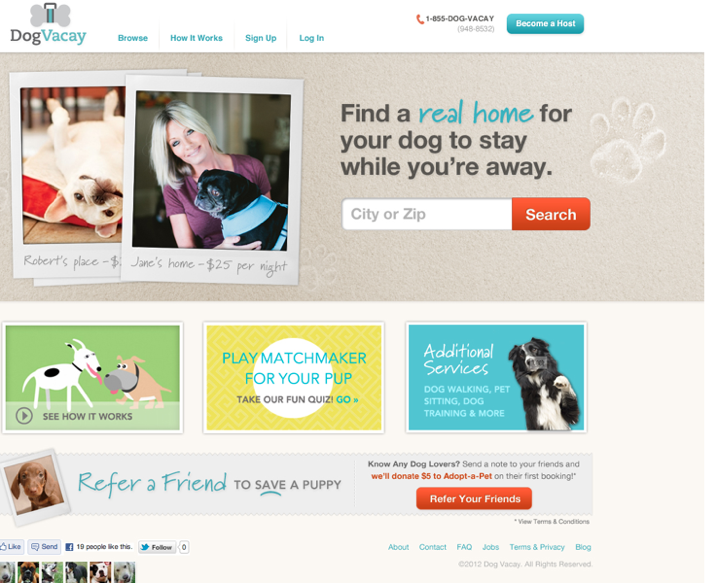 While these people have generally been found via word of mouth or sites like Craigslist, DogVacay allows these pet care providers to sign up for a free listing for dog owners who are looking for boarding and dog-sitting options. The platform gives hosts complete control, from setting their own rates, deciding what size and type of dogs to host, and more. Each host is vetted via interviews and background checks with DogVacay staff before posting on the site, where the startup evaluates potential caregivers based on the amount of room in their homes, past experience and more. And DogVacay also includes user reviews for each host, social network connections, and will even train hosts in basic dog care. 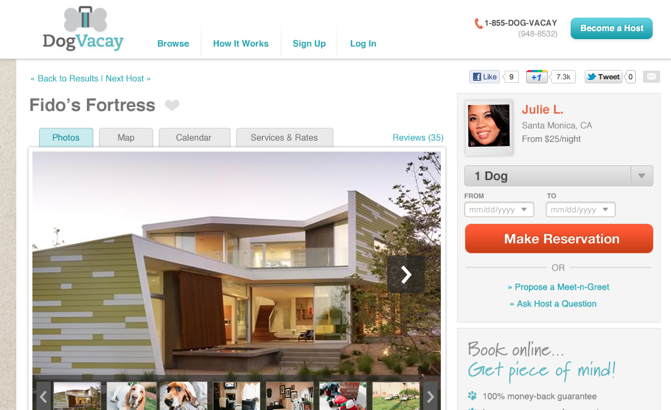 Dog owners can sign up on the site and book services similar to the way you would book an apartment on Airbnb. In addition to boarding services, users can also find dog walkers, trainers, day-care, pet-sitting (in their own home), and other unique services like pet massage. DogVacay takes a 5 to 10 percent service fee from the host. This is actually a huge potential market, as Science CEO Mike Jones explains that Americans spend nearly $10 billion per year on pet boarding and other services. DogVacay faces competition from Rover.com. And who knows; maybe Airbnb will launch Dogbnb.